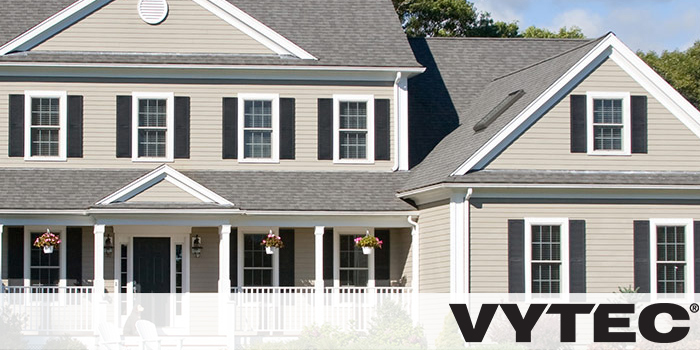 Vytec Prestige offers a lifetime of performance, beauty and low maintenance …that’s what homeowners can expect when siding their homes with Prestige. Innovative features manufactured into this high-quality vinyl siding add up to a sound investment in home value. Available in over twenty new colors and five rich, bold expressions colors, Prestige heavy duty .044 gauge thickness siding is in stock in over 13 colors. TruColor® Protection Technology provides superior color retention performance. Rolled over nail hem adds strength where the panel is attached to the wall, resisting wind loads and helping smooth wall irregularities. Project on a budget? Vytec Nantucket offers both beauty and affordability. Engineered for durability, it resists scratching and denting. And because color is manufactured right into the panels, they won’t blister like painted surfaces–keeping maintenance to a minimum. Available in a broad selection of colors and profiles, Nantucket vinyl siding offers a distinctive look that’s virtually maintenance-free. Nantucket is in stock in over 12 colors in 4-1/2” dutchlap and D-4 traditional profiles. *see actual warranty for details.